We all see or drive on them every day. They provide both a route for high-speed automobile transportation, while at the same creating barriers between our city neighborhoods. Like it or not, interstates 81 and 690 are a very real part of our urban fabric in Syracuse. Although there is good chance that the elevated portion of I-81 between downtown and university hill will be removed in future years, a substantial portion of the highways will still remain slicing through the city. These barriers will remain into the future, disconnected from the urban environment. 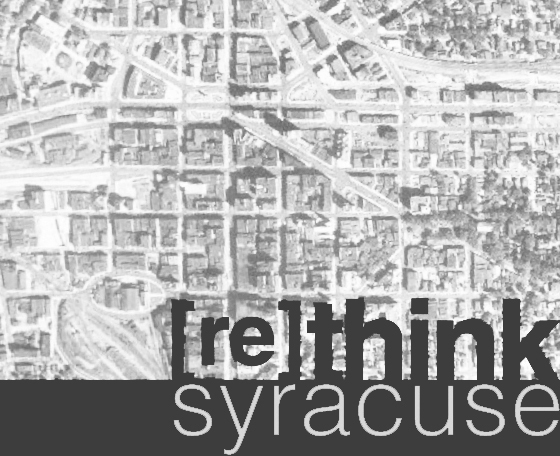 Imagine a way in which our city could be reconnected, while working around the existing downtown elevated highway interchange, and introducing programs traditionally found in the suburbs into the core of Syracuse. Movie theaters nestle themselves into the dark recesses between and under the highways, while a big box store floats above, with light monitors allowing natural light to flood into the spaces. The large roof of the big box store would allow for swaths of urban farming, and the south-facing portion of the structure can contain vertical greenhouses for year-round farming. Foods grown on site combine with area farmers to be sold in a year-round farmers market that can be encloed in the cool months and opened up wide for the warmer months. 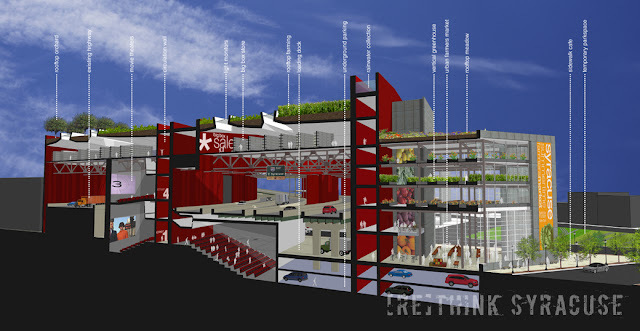 Plenty of parking is concealed underground, and all the other spaces in the structure are flexible for conversion into other uses, such as retail and office space. This new structure would hide the traffic, soften the noise, and be built of materials that can clean exhaust pollutants from the air. Suddenly, real estate adjacent to the elevated highways would skyrocket in value and buildings could fill former parking lots, reconnecting the currently disjointed urban fabric.